A few days ago, I returned from Nine Worlds 2016, aka: London Geekfest. This was the third Nine Worlds convention I’ve been to, and true to form I enjoyed it a great deal. That I enjoyed it in spite of a spot of sub-optimal health says a lot about the quality of the event. 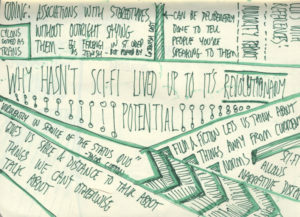 As has become my habit at these things, I made some sketch-notes at pretty much every panel I went to. I say “pretty much every…” because there were a couple that were either too dark or too crowded, and because I spent a couple of sessions lounging on beanbags watching… well, I’ll come to that. 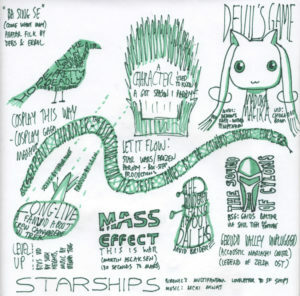 Some of the sketch-notes aren’t up to my usual standards. In my defence, I wasn’t well and I was a bit out of practice. But all the same, I’m uploading them here so you can see them. 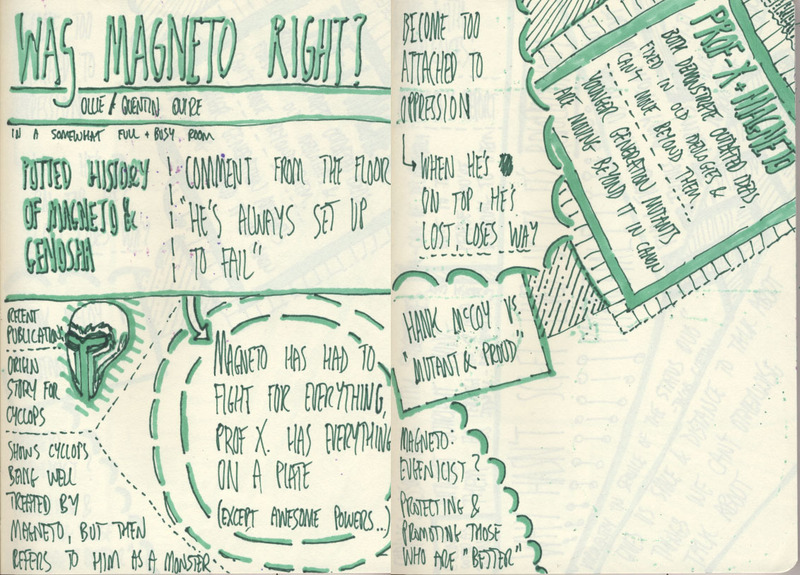 I started the con with “Was Magneto Right?” – a presentation on the history of Magneto in the X-Men, followed by an exploration of how the various mutant groups interact with their leadership. I was interested to learn that in the more recent comics continuities, things are being shaken up by new leadership and new ideas, moving beyond the leadership of Professor X and Magneto, with a new generation of mutants taking up the reigns and changing the conversation. Sketchnotes from the “Was Magento Right” talk. 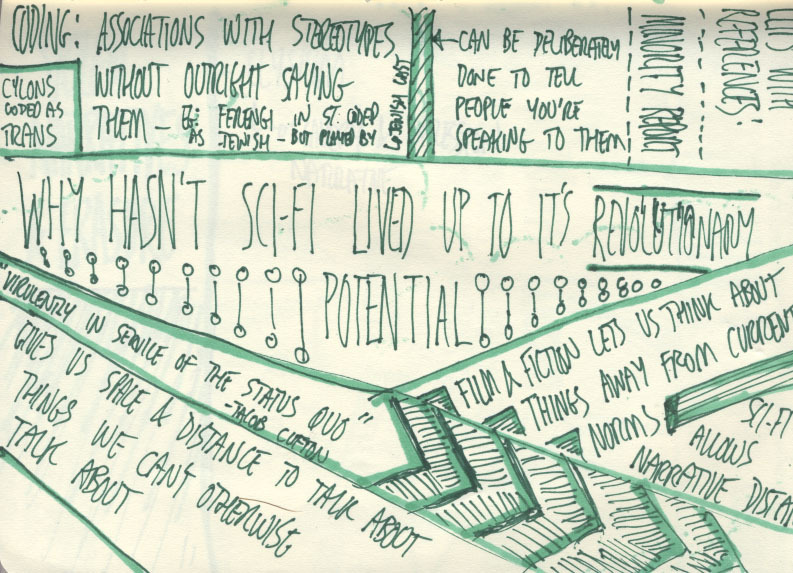 Why Isn’t Sci-Fi More Revolutionary? This wasn’t quite the session I was expecting, but it was interesting all the same. I was expecting a session on social change and revolution as portrayed or espoused in fiction… but what I got was an discussion on sci-fi’s long and unfortunate history of -isms and -phobias (racism, sexism, transphobia, etc…) and how to recognise them and move beyond them. 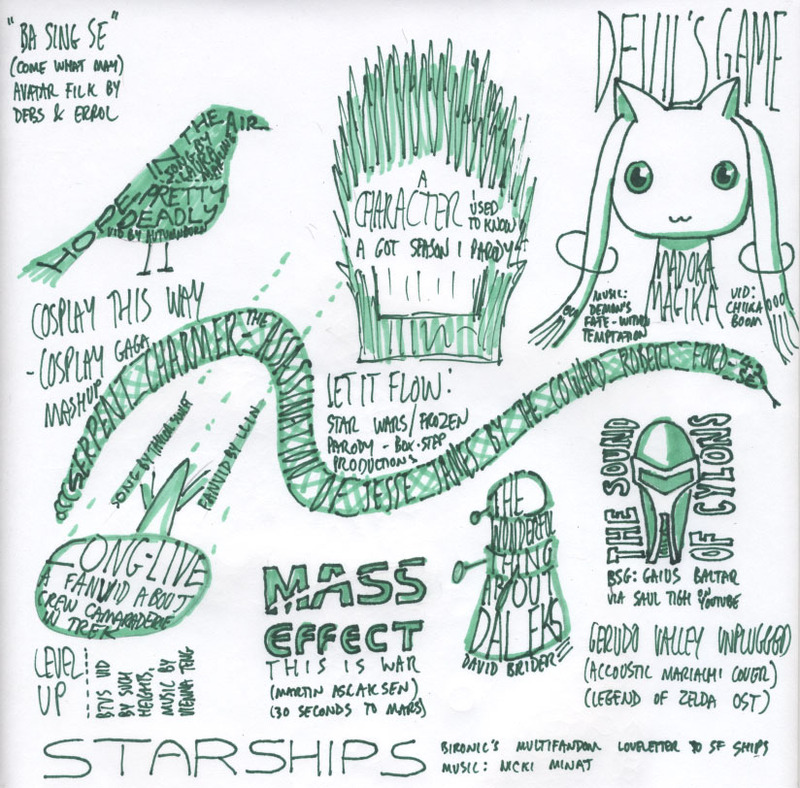 Why Hasn’t Sci-Fi Lived Up To Its Revolutionary Potential? 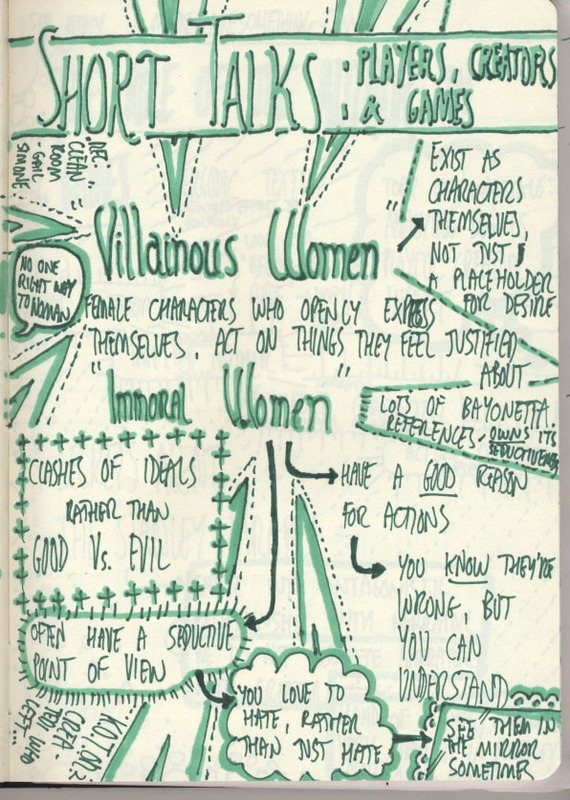 This was a pair of talks – one about villainous or immoral women in games, and another about the role of the creator in the game. I’ve sketch-noted them separately. The speaker loves villainous or immoral women characters in her games. She prefers them to other female characters because the villainous ones are typically the only ones that openly express themselves and act on whatever they feel justified to act on. 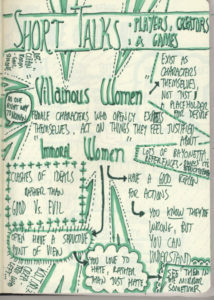 They often exist as characters in their own right, whilst other female characters are there as placeholders for desire. She commented that a good villainous woman will usually have a seductive point of view – not meaning that they’re a seductress or anything like that, but that they have reasons to be who they are and do what they do… and that you can recognise them in the mirror some days. You love to hate them, rather than just hating them. I enjoyed this talk a lot. It was well delivered and well constructed, but my notes failed to capture much of it… and I realise some of what I captured isn’t quite right. I know what I meant by it, but I can’t quite remember what the right words were to correct it. 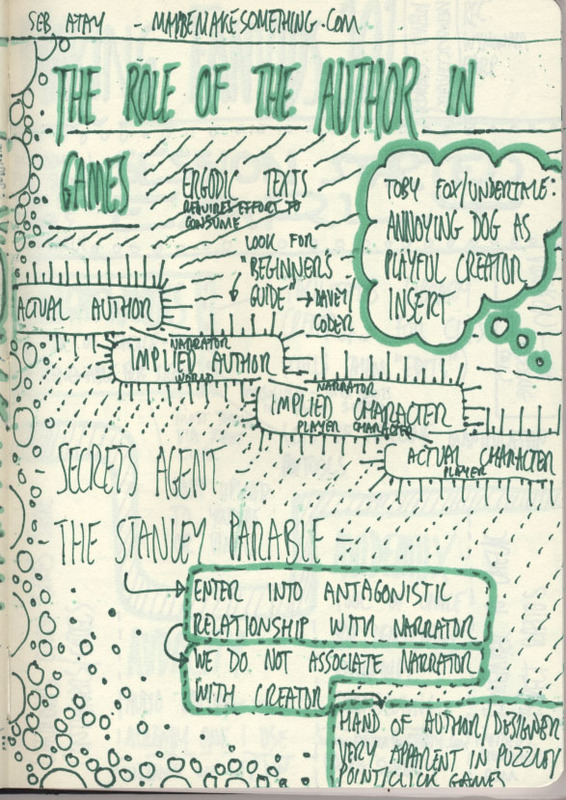 Mostly the mistakes are in the continuum for actual author to actual character – where I lost the plot a bit whilst taking notes and had to pay closer attention to get the thread back… and so the sketch-noting autopilot took a back seat again. 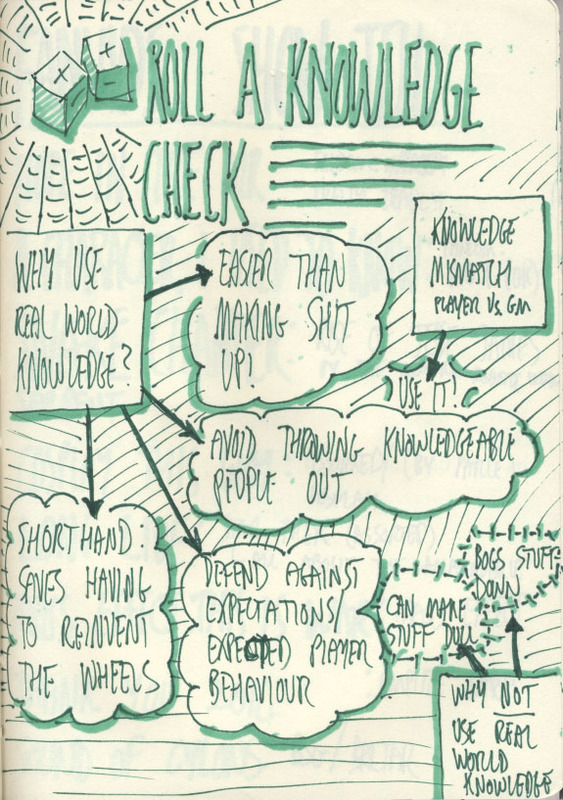 The sketch-notes are always secondary to my listening to the speaker – after all, I’m at the con because I want to be, and the notes are secondary to that. I then spent the rest of Friday evening with an assortment of friends in the bar. Well, in the bar and the toilets… as previously mentioned: a bit ill.
For the first time at a con, I ended up with some real cross-pollination of friend groups. Sure, I’ve had groups of friends bump into each other at cons before, and friends who know each other through other circles but being in a mob consisting of people I know through my local crowd of geeks and gamers and folks I know from LOTNA was good. So, a bunch of IFIS (Sci-Fi society of Royal Holloway – the local university I didn’t go to) related folks and LOTNA (League of the Non Aligned – a London fan group I’m part of) ended up mixing a fair bit… which can only be a good thing. There were even some folks I know from BarCamps mixing in occasionally! In the end, I had to bale, though. I felt terrible, and a friend kindly arranged an Uber to take K and I back to the hotel we were staying in. Fanfic has never really grabbed me. I can see the appeal, but I don’t really feel it. Fanvids, however, have caught my attention. They tickle my interest in remix culture, and a lot of it comes from a place of squee, and I can pick up on that. By “a place of squee”, I mean that there’s a pretty daunting barrier to entry in terms of skills and time investment… not to mention having to have access to a library of source material. To put the required effort in, you have to have a real passion for it… and that can’t help but come out in the material. Sometimes there’s an underlying commentary, sometimes it’s just pure, unbridled love. Sometimes fanvids subvert the source, and other times they build it up to something that exposes layers you hadn’t realised were there. Either way, I’ve found I enjoy them. I’ve also attempted to do some video editing in the past, and struggled with both a lack of tools and a lack of knowledge. So I wanted to go to this session… and was slightly disappointed when I got there five minutes early and found it already five minutes in! Thankfully, I’m good at filling in blanks, and I caught up pretty fast. The best thing I got from the session? A recommendation for Lightworks, which has a free version. I also picked up some pointers for where to find tutorials – but those are on a VidUKon flyer, which I don’t have to hand… you might find them on the VidUKon site? 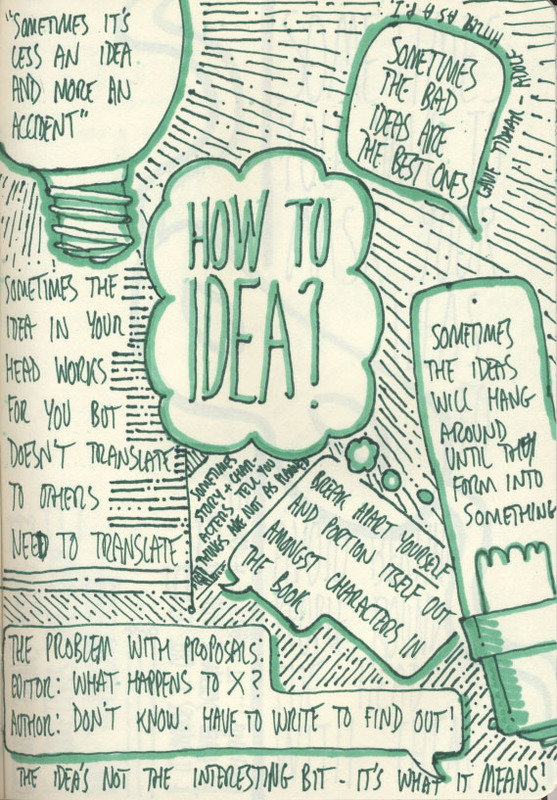 Ideation (yes, it’s a real world – the moment of ideation is the moment an idea happens in your mind) and related processes are a subject close to my heart. As a professional designer (interaction design predominantly), generating, sorting and working with ideas is my stock-in-trade. This session was largely about how authors generate and work with ideas, and it was very interesting to see how things are remarkably similar to in my line of work – you have to have all the ideas so that you can tell which are good and bad. You have to be able to take them far enough to tell them apart, and to cull the bad ones whilst retaining them enough that if the wind changes and they turn out to be good after all, they’re there ready and waiting. I wanted to go to a talk on imposter syndrome and individual competence. I really do get imposter syndrome quite a lot – both professionally and around my hobbies… so it’s a personal thing. And that, right there, is why, had I not had a clash, I should have gone to it. If you know me well, you know that I have a soft spot for truly terrible film. Not deliberately terrible film, but the ones where someone clearly thought they had something, but just couldn’t quite get there. At a previous Nine Worlds, I went to the Duke Mitchell Night of the Trailers and decided I needed to do that more often. So this slot was a no-brainer. Lounging about on beanbags in front of a large projection screen watching a cavalcade or bizarre or execrable trailers? What’s not to like! Thoroughly enjoyable. I can remember no highlights (or low-lights) at all, but I remember the vibe in the room and I remember enjoying it immensely… as usual! This panel didn’t really contain any surprises or massive insights, but it was enjoyable all the same. 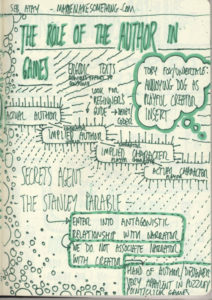 The notes pretty much cover it, although without the entertaining panel banter that went with it. As somebody who’s been playing and GMing games (on and off) since the 1980s, it was interesting to hear other people’s takes on the topic. I’m not sure what I did after this slot – I think it involved talking to other humans. It should have involved eating, but it didn’t for some reason. I think calling this a party is a stretch, since it’s basically more lounging on beanbags in front of a screen, watching the weird and the terrible cinematic and video… things that have been found for our viewing “pleasure”. I must confess: Whilst I still enjoyed this a lot, it was a little bit heavy on the Satan. Probably because one of the recent finds that the Duke folks made was a motherlode of “satanic panic” instructional videos, including videos for law enforcement about spotting a) satanic cults and b) Dungeons and Dragons! The supercut of one of the Anti-D&D satanic panic preachers addressing his congregation, but with every word other than “Satan” or “Satanic” (and a couple of others) removed for comic effect was amusing… but ran a bit long. I get that that was the point of it, but it ate a lot of the time. Still, in spite of having slightly over-satan’d the pudding, it was a fine evening of bizarre entertainment, topped off with a truly terrifying (and weirdly well delivered & produced) “9-11 truther” music video. Several of the friends I hadn’t realised would be attending the con until I saw them would have loved it. If they read this and see the descriptions, they’ll probably know who they are! Of course, being up against the Bifröst cabaret reduces the audience, but if ever you get a chance and want a cabaret alternative… this one’s a good’un. After that, I ambled back to our hotel, where K had fled earlier due to being wiped out. Of course, I couldn’t find her, as she’d just finished eating in the restaurant. Which I hadn’t done yet, so she confused the staff by coming back with me to have some wine whilst I ate. A very pleasant meal. We’ve actually both said that we’d happily go back just to eat if we need somewhere in the area for a nice meal. That’s the K-West hotel between Hammersmith and Shepherd’s Bush. I’ve already talked about FanVids, so I won’t give the spiel here. This was basically an audience participation session where folks suggest their favourites and they get shown on a big screen. 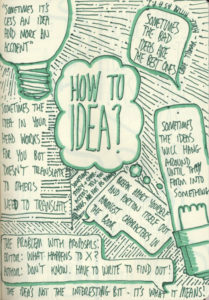 The sketch-notes cover it pretty well. Most of these are on either YouTube or Vimeo… and you can find them easily enough. 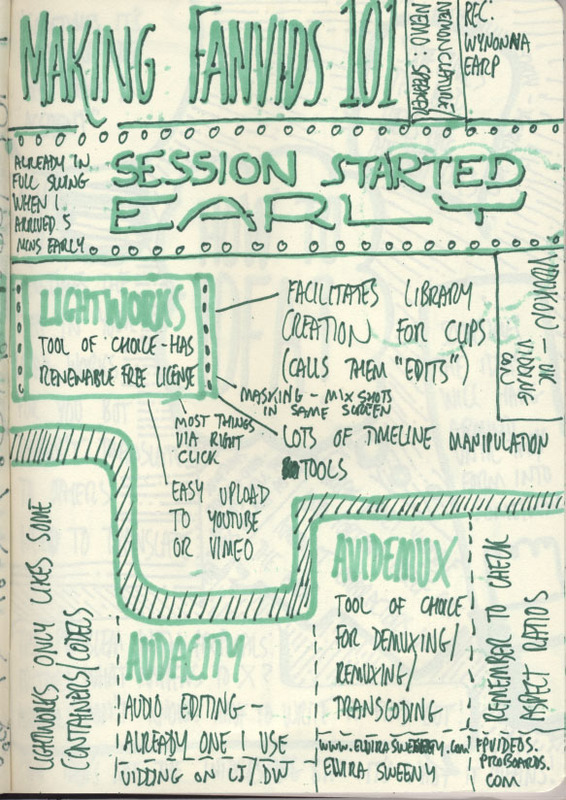 There were more on the list that didn’t get shown due to running out of time… and those aren’t on the sketch-note. Because I haven’t found the transcription of that list yet. Amusingly, the montage of Empire LARP photos… I commented to the person who suggested it that they’d managed to find one with remarkably few people I knew in it. I actually said “nobody”, but on re-watching, that’s a lie in two ways: Firstly, some of the crowd shots had folks I know in it, one easily visible because there’s a sudden drop in height in a row of people. Secondly, It turns out I know the chap who created the video! My brain was really starting to fade at this point, but I got a lot of notes! I’d have liked slightly more depth and direction to this panel… but I think that this late in the con, that was probably asking a bit much! This was an excellent session. 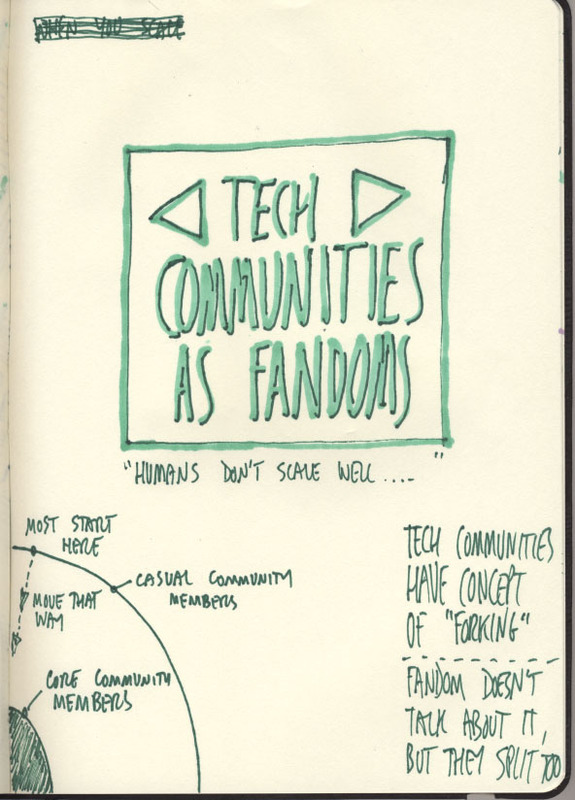 I can’t say a great deal more than that, other than that it was well presented and that the speaker said she delivered the same talk in both fannish and tech communities… and commented a lot on the differences in reactions. 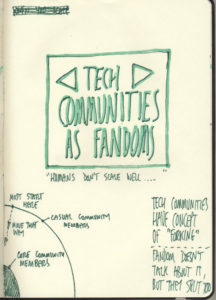 Later in the session, she commented on how she thinks there should be more crossover of the communities, as Fandom is usually a good example of how to do online community well. After the slot, I mentioned to the speaker that I’d seen Maciej Cegłowski (creator of pinboard, a tool widely used in the fic scene) deliver a talk at a web tech conference… I’ve since tracked down the video of that talk, and I highly recommend both it and the conference, dConstruct (if it still runs). In fact, any of the Clearleft conferences are worth it. 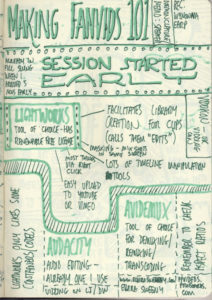 I have neither sketch-notes or memory of this session. I’m pretty sure I was in the room, but my brain faded and it was crowded. It was, after all, the tail end of the con. I had the next day off work to recover, which would usually have been enough, but I was unwell before the start of the con and am still unwell now. As I said earlier: I enjoyed the con in spite of my health whilst attending, and that’s a sign of a damned fine con. For the past couple of cons, my standard con-going equipment has included two aeropresses and a bunch of decent coffee. I can highly recommend this approach.